We are undergoing many exciting changes here at Advanta Cabinets. In addition to new finishes we will be unveiling later this summer, we are excited to share with you more changes we are making to our product line to better meet our customers’ needs. We are pleased to announce new door styles and options available to order now. 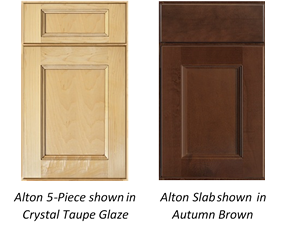 All doors are available in all maple and birch finish combinations. Alton’s 3/4" thick solid maple door frames and drawer fronts are assembled with five-piece mortise and tenon joinery. The recessed flat center panel is made from genuine maple wood veneer. These full overlay doors and drawer fronts feature a single step back bevel edge on door frame. Alton offers both slab and 5-piece drawer options and is available in Premier, AllWood, and Extreme construction. Our new Maxwell door offers 3/4" thick solid birch door frames, five-piece miter construction, and mortise and tenon joint assembly. The recessed flat center panel is constructed of genuine birch wood veneer that produces a very uniform and appealing look in color and grain. 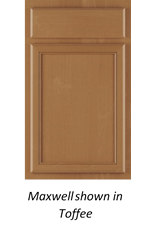 Maxwell’s standard reveal door features a single step back bevel edge profile. The edges are repeated as well in the 3/4" thick solid birch slab drawer fronts. Maxwell is available in Advantage*, Premier, AllWood, and Extreme construction. You asked and we listened! 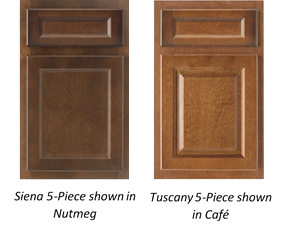 In response to customer demand, we are now offering a 5-piece drawer option for our popular Siena and Tuscany birch door styles. Our Siena (flat panel) and Tuscany (raised panel) doors feature ¾” thick solid birch door frames assembled with five-piece mortise and tenon joints and genuine birch wood veneer center panels. These standard reveal doors feature a single step edge profile. The softly rounded edges are repeated as well in the 3/4" thick solid birch drawer fronts. The slab drawer front option is available in Advantage*, Premier, and AllWood construction. The new 5-piece drawer front option is available in Premier, AllWood, and Extreme construction. Visit our resource center to download literature on these beautiful new door styles! For more information, please contact your sales representative, or reach out to us at sales@advantacabinets.com. *Advantage construction offers limited finish and SKU options.